The Spanish Suite is composed of some suites that are characterised by a modern and particular design, a guarantee of high quality. All our suites are soundproof and they are equipped with air conditioning, free Wi-Fi, flat-screen TV, safe and private bathroom with services and complimentary toiletries. The rooms’ daily cleaning is included. The Spanish Suite is composed of some suites that are characterised by a modern and particular design, a guarantee of high quality. 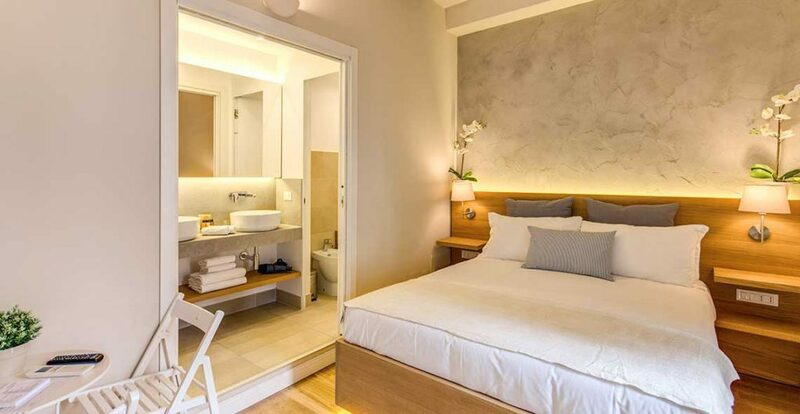 In our deluxe rooms is possible to have a double room or twin beds (at the request) with a private bathroom, we have air conditioning and an area of 19 mq. Our rooms are perfect for those who want to stay in the historical center of Rome and who wish to have bigger spaces in the room, for a best comfort and a more satisfactory experience. The daily cleaning is included and free Wi-Fi is available in all our rooms. Check-in: from 2 o’clock p.m. to 8 o’clock p.m. / Check-out: until 12 o’clock p.m.
*For late arrivals there is an additional price of €30.